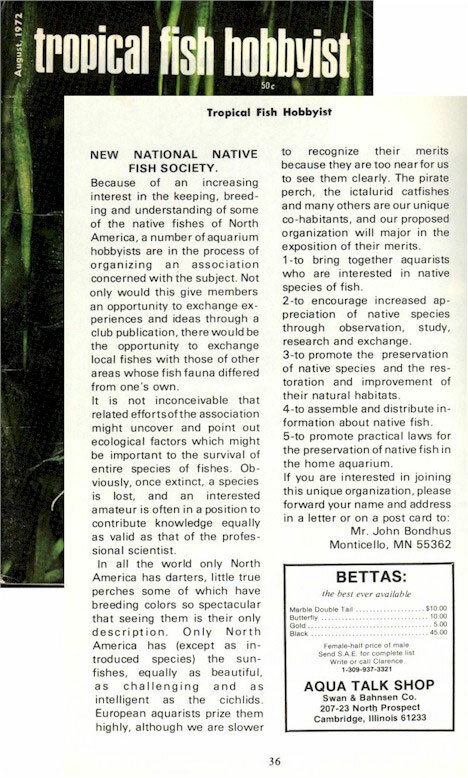 An editorial by John Bondhus from the August 1972 Tropical Fish Hobbyist announced the formation of a "National Native Fish Society". Shorly thereafter, Mr. Bondhus started the North American Native Fishes Association, and the rest, shall we say, is history! Because of an increasing interest in the keeping, breeding and understanding of some of the native fishes of North America, a number of aquarium hobbyists are in the process of organizing an association concerned with the subject. Not only would this give members an opportunity to enchange experiences and ideas through a club publication, there would be the opportunity to exchange local fishes with those of other areas whose fish fauna differed from one's own. It is not inconceivable that related efforts of the association might uncover and point out ecological factors which might be important to the survival of entire species of fishes. Obviously, once extinct, a species is lost, and an interested amateur is often in a position to contribute knowledge equally as valid as that of the professional scientist. In all the world only North America has darters, little true perches some of which have breeding colors so spectacular that seeing them is their only description. Only North America has (except as introduced species) the sunfishes, equally as beautiful, as challenging and as intelligent as the cichlids. European aquarists prize them highly, although we are slower to recognize their merits because they are too nearfor us to see them clearly. The pirate perch, the ictalurid catfishes and many others are our unique co-habitants, and our proposed organization will major in the exposition of their merits. 1 - to bring together aquarists who are interested in native species of fish. 2 - to encourage increased appreciation of native species through observation, study, research and exchange. 3 - to promote the preservation of native species and the restoration and improvement of their natural habitats. 4 - to assemble and distribute information about native fish. 5 - to promote practical laws for the preservation of native fish in the home aquarium.